We are offering Baby Shower Favor to our clients. Gift hamper basket with high grade raw material in a favourable price for different occasions packaging for more detail just write us. Baby Shower Packaging Material by RG Creations. 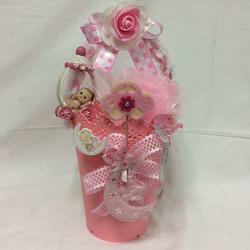 I supply handmade baby shower hampers gifts n chocolate box as per your theme. Our organization has successfully expanded its business in market owing to the offered elevated quality range of Baby Shower Favor Box. We provide variable kind of Frock, Welcome Letters or any kind of Customized Glitter Sheet Cutouts for Wall/Room decorations. This Frock height is 10". Keeping the diverse requirements of the customers in mind, our company is involved in offering superb quality range of Fancy Baby Shower.